The Chesapeake Bay is North America's largest estuary and has a shoreline of more than 12,800 kilometers (8,000 miles). The bay is a long, narrow arm of the Atlantic Ocean that extends northward into Maryland and cuts the state into two parts. In addition to Maryland, the Chesapeake Bay drainage basin includes parts of the states of West Virginia, Virginia, Pennsylvania, New York, Delaware, and the entire District of Columbia. The cities of Richmond, Virginia; Washington, D.C.; and Annapolis, Maryland lie within its basin boundary. Commodities have been exported and imported through the Chesapeake Bay since the Jamestown settlers inhabited the area in the early eighteenth century. Exporting and importing a multitude of goods today is a competitive business. Important deep-water navigable ports on the bay include Baltimore, Maryland, and Norfolk, Newport News, and Portsmouth in Virginia. With deep-sea vessels containing equipment of the latest marine technology, U.S. companies can export large volumes of goods to other countries in a short period of time. The most profitable commodities imported into the Chesapeake Bay area include natural rubber, paper, auto parts, steel, iron, alcoholic beverages, grain, and tobacco. The strongest trade partners for the Chesapeake Bay include Brazil, Colombia, Venezuela, Japan, Greece, the United Kingdom, and Germany. Chesapeake Bay is approximately 323 kilometers (200 miles) long as it extends from Norfolk, Virginia to Havre de Grace, Maryland. The bay ranges in width from between 5.5 kilometers (3.4 miles) near Aberdeen, Maryland, to 56 kilometers (35 miles) near the mouth of the Potomac River. The mouth of the Chesapeake Bay is a narrow passage—19 kilometers (12 miles) wide—between its northern point (Atlantic side) near Cape Charles, Virginia, and its southern point (inland side) close to Cape Henry, Virginia. 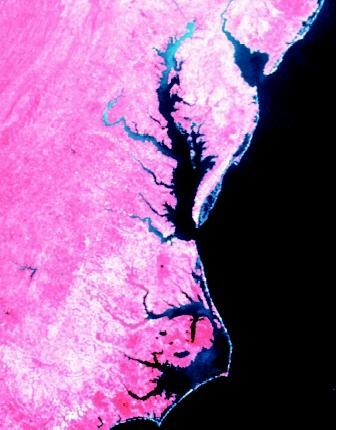 Cape Hatteras (lower right), Chesapeake Bay (middle), and Delaware Bay (upper right) are visible from this satellite image. The Atlantic Ocean is to the right. (19 million gallons) of water per minute. The Chesapeake Bay contains on average more than 68 trillion liters (18 trillion gallons) of water. Chesapeake Bay, the largest of 130 estuaries in the United States, is a complex ecosystem that includes important habitats and food chains . The bay supports more than 3,600 species of animals, plants, and fish, including 348 species of finfish, 173 species of shellfish, and over 2,700 plant species. Fish of all types and sizes either live in the bay and its tributaries, or they use the waters as they migrate along the East Coast. Every year, 1 million waterfowl rest in the bay's basin as they migrate along the Atlantic Migratory Bird Flyway. More than 500,000 Canada geese winter in and near the bay. The Chesapeake Bay is a commercial and recreational resource for more than 15 million people who live in and near its watershed (drainage basin). The bay produces approximately 500 million pounds of oysters, crabs, and other seafood per year. The richness of its species can be seen in the value of the bay's annual fish harvest, which is estimated at over $100 million. It yields more oysters and soft-shelled crabs than any other region in the United States. The Chesapeake Bay is the largest producer of blue crabs in the world, although this fishery has recently experienced declines. Since the early twentieth century, the Chesapeake Bay has experienced serious environmental degradation. Problems include large reductions in sea grass, reduced amounts of finfish and shellfish (especially oysters and crab), seasonal depletions in dissolved oxygen, and increases in sedimentation . Environmental concerns were voiced in the 1970s over the damage to key habitats and the decline in water quality. Species in bay waters were being negatively affected, resulting in threats to the commercial and recreational activities. Most marine scientists believe that these changes are related to ecological stress due to increased human activities. Causes include deforestation, agriculture (including fertilizers), urbanization, pollution , and sewage. The Chesapeake Bay Commission predicts that by the year 2020, the population of the bay watershed will increase to 17.4 million. Without additional environment attention on the bay ecosystems, the Commission predict that stress on the natural system will increase dramatically. One serious pollution problem in Chesapeake Bay has been eutrophication caused by excessive nitrogen and phosphorus. The increased fertility of the bay's waters has caused prolific algal blooms. Algal concentrations in the water column and dense mats of vegetation on the water surface can shade out native aquatic plants. The oxygen depletion resulting from the massive algal die-off disrupts the balance of the ecosystem. The primary sources of nitrogen and phosphorous have been the fertilizers and animal wastes of farmlands in the basin. Toxic chemicals are entering the Chesapeake Bay and its food chain. These poisonous chemicals come from several point and nonpoint sources including industrial discharges, oil spills, agricultural runoff, urban runoff, and rainfall. Metals such as cadmium, copper, chromium, lead, nickel, and zinc are polluting the bay. In 1975, the massive release of the pesticide, Kepone®, into the James River in Virginia was one of the worst toxic inputs into the bay's ecosystem. Most toxic substances persist in the Chesapeake Bay environment for many years, and have adverse affects throughout its food chain. One factor that complicates this situation is the bay's long residence time and low flushing rate. Only 1 percent of the settleable waste that enters the Chesapeake Bay is flushed to the ocean. The remainder settles in the bay's waters to form bottom sediment. Toxic contamination has been a prime suspect in the demise of several species in the bay. One particular ecological concern is the blue crab, a popular commercial fish within the Chesapeake Bay. The 2001 Chesapeake Bay commercial blue crab harvest of approximately 52 million pounds was well below the average of about 75 million pounds that has annually occurred from 1968 to 2001. Chesapeake Bay is the world's largest producer of blue crabs. 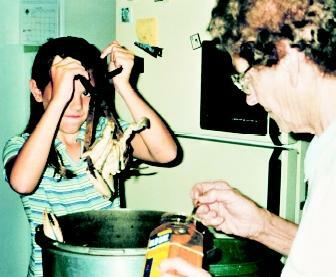 Generations continue to enjoy this seafood favorite. crab at increased risk for not rebounding. With low population numbers combined with a high fishing catch rate, the blue crab continues to be a great concern. Mute swans, native to Europe and Asia, were transported to North America in the late nineteenth century by European immigrants. Some swans eventually escaped or were deliberately released into the wild. In Maryland, the mute swan population grew from five captive swans that escaped in 1962 to more than four thousand swans as of 2000. Because mute swans did not evolve with the native species in Chesapeake Bay, these aggressive invaders have caused many problems. Mute swans are suspected of causing a 30-percent decline in Maryland's wintering population of tundra swans. In the early 1990s, mute swans caused a colony of least terns and black skimmers (both threatened species in Maryland) to abandon their nesting site. Mute swans overgraze bay grasses, eliminating habitats for crabs, fish, and other species. Some mute swans are aggressive and will attack humans, including small children, in defense of their nest territory and cygnets (their offspring). This territorial behavior can be a nuisance, and renders some land and water areas inaccessible to people during the swan nesting and brood-rearing season. Swans have even been documented killing mallard ducklings and Canada goose goslings. Since the mid-1990s, the Maryland Department of Natural Resources, along with some federal agencies, has taken measures to control mute swan populations. In 1998, Maryland's governor appointed a committee to develop mute swan management recommendations. In 2002, the management plan was in its public comment period. The recommendations combine lethal and nonlethal methods intended to reduce the mute swan populations to levels compatible with native wildlife, natural ecosystems, and human environments. Due to impacts from serious environmental threats, the U.S. Environmental Protection Agency (EPA) recognized the Chesapeake Bay as a damaged ecosystem. The EPA conducted a $27 million research study from 1976 to 1983. This study concluded that immediate and intensive efforts were needed to save this estuary and restore its ecological health. In 1983, the Chesapeake Bay Agreement was signed and the federal government and the states of Maryland, Virginia, and Pennsylvania, and the District of Columbia pledged to take action to reverse its environmental deterioration. These actions included upgrading sewage treatment plants, controlling urban runoff, controlling manure and fertilizer runoff, reducing soil erosion, issuing stricter discharge permits, and banning the use of phosphorous detergents. This agreement outlined the goal of reducing the amounts of nitrogen and phosphorus entering the bay by 40 percent by the year 2000. These strategies have had some measurable success in saving the bay. The Chesapeake Bay Agreement has been amended in 1987, 1992, and 2000. These agreements reflect the ongoing political process of strengthening regional efforts to save the bay. Two important organizations working toward an improved Chesapeake Bay environment are the Chesapeake Bay Program and the Small Watershed Grants Program. The Chesapeake Bay Program is a partnership among the states of Maryland, Virginia, Pennsylvania, the District of Columbia; along with the Chesapeake Bay Commission and the federal government. It was formed in 1983 as a result of the first Chesapeake Bay Agreement. The partnership has stated a number of bay protection and restoration goals, and it strives to mobilize the resources of the governmental sector with the private sector to achieve its goals. The Chesapeake Bay Program operates as a voluntary, collaborative resource management program. It has set goals related to fisheries, wetlands , submerged grasses, nutrient reduction, toxins, sustainable development, and citizen involvement. The Small Watershed Grants Program provides grants to organizations working on a local level to protect and improve watersheds in the Chesapeake Bay basin, while building citizen-based resource stewardship. The purpose of the grants program is to emphasize the water quality and living resource needs of the Chesapeake Bay ecosystem. The Small Watershed Grants Program has been designed to encourage the development and sharing of innovative ideas among the many different types of organizations involved in watershed protection activities. Concerted efforts are being made to improve the ecological health of the Chesapeake Bay. While progress has been made, the recovery of this resource will require long-term effort and the active participation of all six states and the District of Columbia lying within its drainage basin. Given projected population increases, these efforts to control nutrient and chemical discharges into its rivers and to improve waste treatment technologies are vital to protecting the water, habitat, and species of this estuary ecosystem. SEE ALSO Algal Blooms in Fresh Water ; Algal Blooms in the Ocean ; Bays, Gulfs, and Straits ; Crustaceans ; Ecology, Marine ; Estuaries ; Pollution by Invasive Species ; Ports and Harbors ; River Basin Planning ; Transportation ; Watershed, Restoration of a .
Dorbin, Ann E. Saving the Bay: People Working for the Future of the Chesapeake. Baltimore, MD: Johns Hopkins University Press, 2001. Chesapeake Bay Blue Crab Advisory Report 2002. Chesapeake Bay Stock Assessment Committee. <http://www.fisheries.vims.edu/bcar/> . Chesapeake Bay Commission. <http://www.chesbay.state.va.us/> . Chesapeake Bay Program: America's Premiere Watershed Restoration Partnership. Chesapeake Bay Program, Chesapeake Information Management System. <http://www.chesapeakebay.net/> . Ecosystem Trends and Response: Chesapeake Bay. U.S. Geological Survey. <http://geochange.er.usgs.gov/pub/info/facts/chesapeake/> . EPA Chesapeake Bay Program Office. <http://www.epa.gov/r3chespk/> . Tis was a very helpful source for me. It lacks information about toxic pollution. It needs more of it.